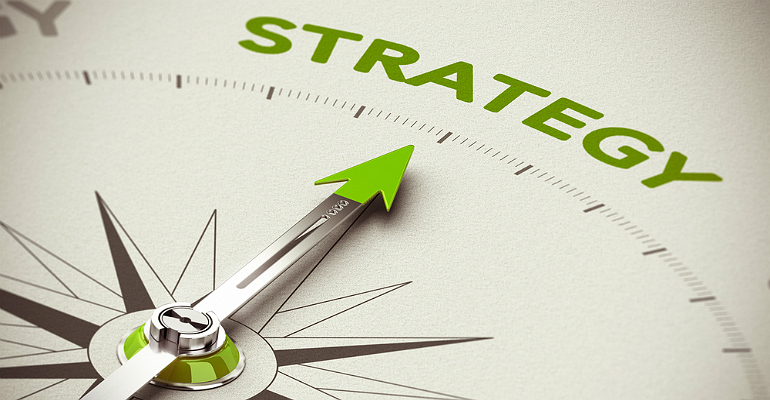 Is There Room for a Volvo in Your Corporate Strategy? There's a lot you can learn from the Swedish car maker about reinvention. Wouldn’t it be great if there were a simple framework and set of tools to help partners with business transformation? Google’s Jim Chow and I think so. Together with other members of the Channel Futures Think Tank, we’ve been hard at working building these out. Which brings me to you. When it comes to reinvention and transformation, where do you stand? Before you answer, take a second and recall some business history. We all know that technology has upended countless companies from Polaroid to Yahoo to Novell, but we often overlook the great many companies that have successfully transformed. Famous examples include American Express (from courier services to financial services), Western Union (telegrams to money transfer) and Wipro, which started off selling vegetable and salad oils before landing upon technology services. It’s true. Other transformations are more subtle, though no less significant. Take Volvo. Since 1927, the Gothenburg, Sweden, company has manufactured cars and trucks. It still does today. But Volvo is hardly your father’s Oldsmobile. Here’s the story of Volvo’s transformation and why it matters to you. Throughout most of its history, Volvo was an admired manufacturer of practical, innovative and safety-conscious automobiles. It was the favorite of college professors and soccer moms everywhere. Really. A study of car brands in China found that consumers there imagined Volvo drivers to be “educated, valuable members of society who are family-oriented and morally upright,” according to the Wall Street Journal. For all its engineering prowess and brand goodwill, Volvo fell on hard times after being acquired by American automaker Ford in 1999. Ford couldn’t decide if it wanted to transform Volvo into Toyota or Audi. While it dithered, sales fell, innovation lagged and losses mounted. By 2010, Volvo was stuck in reverse and teetering on the edge of collapse. Witless as to what to do next, Ford, which paid $6.45 billion for Volvo, sold the Swedish company to Zhejian Geely Holding Group of China for just $1.8 billion. Few at the time thought that Volvo had much of a future. But Geely surprised. Rather than move the company to China, it poured billions into Volvo and then “stepped back, went quiet, and let the folks in Gothenburg, Sweden, do their inimitable Nordic thing,” writes WSJ.com Rumble Seat columnist Dan Neil in a recent review. The results have been nothing short of miraculous. Volvo today occupies a coveted niche at the high (read: most profitable) end of the car market. Its new S90 T8 sells for well in excess of $80,000. Moreover, Volvo sales are soaring – up more than 50 percent since 2010 – and innovation is expanding. Last year, the company stunned the auto world when it announced that come 2019, every new Volvo model will be powered by an electric motor, at least in part. How did Volvo turn itself around? One key factor in its transformation was the reconstruction of its workforce. Recognizing that premium automobiles of the 21st century will be defined by software development as much as mechanical engineering, Volvo made a concerted effort to bring in new talent. Volvo recruited people from Google, Nokia, and even fashion manufacturers. The new workers not only helped Volvo created new benefits for consumers, they also helped the car maker become more entrepreneurial, according to HBR.org, which recently showcased Volvo’s workforce transformation. No matter what industry you work in, the takeaways from the Volvo story can apply to any company, save for those that are either blind or stuck. After talking to scores of VARs and MSPs of late, too few speak in terms of “reinventing” anytime soon. Too busy, too tired or too unconvinced, many say. Writing for Digital McKinsey a year ago, authors Peter Dahlström, Somesh Khanna and Jürgen Meffert concluded that companies must be open to radical transformation to find new and sustainable sources of revenue. “Incremental adjustments or building something new outside of the core business can provide real benefits and, in many cases, are a crucial first step for a digital transformation. But if these initiatives don’t lead to more profound changes to the core business and avoid the real work of re-architecting how the business makes money, the benefits can be fleeting and too insignificant to avert a steady march to oblivion,” the authors write. 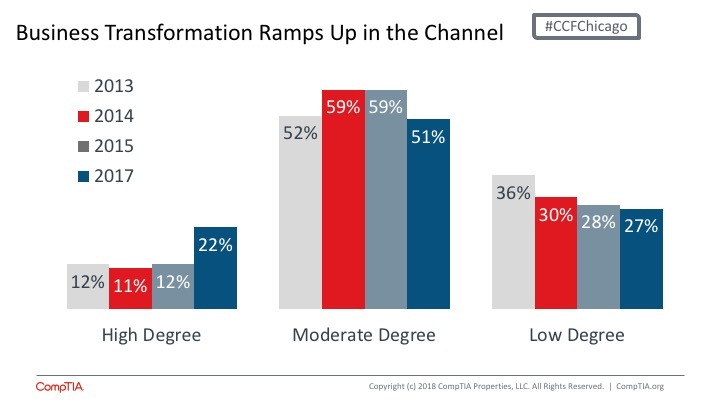 For insights on channel transformations, I turned to our friends at CompTIA, which polled channel companies about their reinvention plans in 2013, 2014, 2015 and 2017. The first three times it asked channel companies about their attempts to transform, a scant 12 percent or so said they had moved forward to a “high degree.” But last year the number nearly doubled to 22 percent of channel companies. So what about you and your company? Do you have plans to re-architect how you make money? It may seem like a silly question to those who literally have more business today than they can handle. But what about in a few quarters when market conditions change? If you think about the span of the channel and the value that it has provided, you know that a meaningful percent of its revenue is obviated by new technology or commoditized by price competition every year. Like inflation, the loss of once-lucrative revenue ads up. Channel companies don’t typically focus on this aspect of the business, however. Instead, they zero in on new opportunities. These days, IoT, AI and big data look promising. But they are slow moving markets that offer a modest-at-best return on investment. Meanwhile, device management becomes more commoditized with each passing day. Same with perimeter security, email migration and data storage. Whether you accept this is up to you. But reality is this: Someone is hard at work trying to disrupt and disintermediate everything that you do today. If the percent of your sales that come from activities or technologies that are less than 18 months old is greater than 20 percent, then you’re likely fine; you’re already transforming. But if the bulk of your business is, dare I say, business as usual, they you may want to take another look at Volvo. Not necessarily to drive, but to study. Volvo was forced to reinvent itself. You have the luxury to drive at your own pace, at least for now.